10/14/2017: This thread has been quiet for awhile, but here's our new reveal trailer! I hope you enjoy! Yooo, this is lookg berrrrutiful! Are you willing to give away any story snippets? Thank you, m4uesviecr, I appreciate it! Sure, I'll talk about the basic story a bit. The main character in the game is something like a priestess; she's been trained to deal with spirits and monsters and things like that - she's the titular "Soul Healer." In the game, you'll go from town to town, getting pulled around by basic disasters caused by spirits, and you'll do your best to either put them to rest, or destroy them if it's impossible to reason with them. We have some really interesting and unique story threads made possible because of this main overarching story thread - we'll be able to try to wring some tears out of players in one town with the tragic backstory of the current quest's spririt, and then jump right into something much more lighthearted for the next area with a different spirit's less dramatic problems. Of course, sooner or later, more characters and large story threads pop up and start to weave together. The stories, locations, and situations we're thinking up for the game are what's most exciting for me; I think (hope, hahah!) we're making something really special here. Thanks for asking! Thank you, Pixel and Cake! Small update for today - a cute fox face enemy! Fox face is too adorable!!! This looks amazing! Oh that's really nice! Faithful to the source of inspiration but not a clone. Keep up the good work. Pretty cool and nice looking. Question: Why did you chose to make a three person coop, instead of two or four? @flipswitch: Thanks! Yeah, like the title says, the game is inspired by Secret of Mana. Still, though, we're trying to make something very unique that'll stand on it's own. The battle system has been revamped from Mana's a bit - magic attacks now charge with the same bar as physical attacks, so you can't cheese through bosses by spam casting anymore, and it gives enemies a change to attack you before you're done charging. Enemies are the same way - all magic attacks need to be charged before being used, so you'll be able to stop them from attacking if you're quick enough. I hope people will like it once they get a chance to play it. @Tito: Thank you for the compliment. We talked about how many players to make the game for awhile, actually. We wanted more than two, because there are three of us (selfish, I know, hahah! ), but we thought with four players, it would be too hard to balance - we want the game to be playable for single players with the AI helping, too, but we thought it'd be too easy to bully enemies with four human players playing at once. We also thought it'd be easier to write a good story with three characters instead of four. One character makes for an epic quest...two is usually reserved for romances or bromances...with three we felt we could have some good group dynamics going on, and with four, again, we thought it might get too crowded. Groups of three just feel natural, I guess? Thanks for the question. Looks great, I love the painterly style of the forest, and the leaves are so cool, just a wee-bit too large for my taste. Main char looks cute, tho I would keep her staff still and straight for the length of the animation, because now it looks a bit like a snake wobbling around. Can you elaborate on the combat system being action-based, and how do you plan on the cooperation between different characters in combat? Sorry I never played SoM. ...Are you HopelessComposer? Why you no tell me you make a devlog? feelings hurt. Similar colors and she even fights ghosts! Nice pixel art, the twitter fox animation is really good. Hope to see some updates. @Batowski: Thanks for the compliment. I agree that the girl's animation needs some work - she's actually one of the first things I drew for the project, and I need to rework most of her animations before they're up to part with the newer art. I'll be updating her soon. I'm sorry for not telling you - I really thought you were one of the first people I PM'd, and *I* was actually a little disappointed that you hadn't responded, hahah! Looks like I missed you somehow. Sorry about that! Since the lovely lady of our team is Japanese, we're drawing a lot from Japanese culture for certain parts of our game, too - our main character's outfit is also purposefully reminiscent of the Japanese miko outfit, though we tried to mix it up with a general budogi, and gave our girl shorter hair, since she's supposed to be an athletic tomboy, instead of just a calm priestess. Remember how Rocky throws leaves as his weapon? And the tanuki suit's powerup is a leaf? Actually - on that note, how about Tom Nook? It's pretty cool learning about all this stuff twenty years after you play these old games. Whenever I learn something new about Japanese culture, there's a good chance I'll remember some old Japanese game or show I loved as a kid, and think "oh, that's where that comes from," hahah! I'll post a bit more later today, since I missed yesterday. Thanks for the compliments and questions everybody. We really appreciate your interest! Today I learned about japanese priestesses... Never thought Pocky's outfit was based on something real. I actually know what a tanuki is from some youtube video but I still thought rocky was a raccoon. Makes sense though. I hope the fox thing is a non-aggressive enemy. I will feel guilty killing something that fluffy and cute. Especially if he squeaks in pain. Yup, learn something new everyday. Like I said, learning about Japanese culture is especially cool if you're a gamer - you really do make a lot of random connections with things you saw but didn't fully understand as a kid. It's really interesting! For the Fox Face enemy, I too agree that he's too cute to kill. 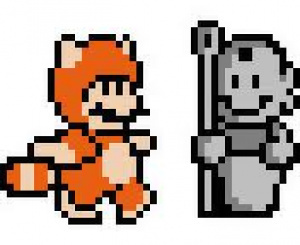 Because of that, you learn in-game that the Fox Faces are forest spirits, making bodies out of old, dry refuse from the forest - when you defeat the Fox Faces, they simply hop into the air and turn into a pile of leaves! That said, the Fox Faces are just mischievous, not evil - when your HP falls below a certain threshold, they'll stop nipping at your heels, and begin actively avoiding you, content to follow you at a safe distance. I love this detail! Super cool to see creatures really interact with the game state beyond the standard idle/attack switch. Thanks, ActualDog. I'm trying to make the game world a little more interesting than an average RPG's. My girlfriend's not a huge fan of games, so she's a great help - if I can make her smile or laugh with the little details and surprises I add, I know I'm doing something right. She's keeping me away from the generic groan-worthy tropes, too, hahah. I think constantly asking myself "will non-gamers like this too?" is actually helping the game a lot. Small update - inventory system! Btw, obviously don't listen to me, but I think the HUD copies a bit too much from the source material, maybe put your own spin on it? I wrestled with this a little myself, too, but after a few designs, settled on this one. SoM's HUD doesn't have too many things to copy - it's a portrait of the character, which we also need, and a charging meter, which again, our game also needs, since attacks and magic alike will be chargeable. I'm not saying our HUD isn't extremely close to SoM's (it is, obviously), it's just that for basic gameplay elements like this, I don't feel very bad having a "if it isn't broken, don't fix it," attitude. Our game is pragmatically using the portraits and and charging meter from SoM because they're needed, and look good as they are, but the combat and game itself feel very different. The meter itself is a little different, too - the HP display flips down into an MP display when charging magic attacks, and the charge meter and HUD itself look a bit more flashy and modern. Thank you for pointing it out, though. It's nice to have this discussion openly. I think it's sort of like a game using hearts as an HP meter. On the one hand, when I see games doing it, I think "ugh, Zelda rip-off." On the other hand, Zelda used hearts as an HP meter because it's natural and makes sense. I think if I played a great game that used hearts in its health display, I'd get over it quickly, and associate that HUD with Zelda as well as the new game. I think it'll be the same here, once people play our game and see how much we're expanding and completely changing SoM's fantastic old formula.